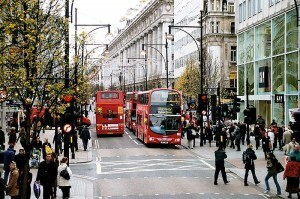 If you are passionate about fashion, you must do at least once in life a shopping trip to London. It is an unwritten rule for all fashion lovers, especially since it acquired the status of fashion capital. Now to move to the interesting part: the shops. Most of them are on Oxford Street where you will find all known brands and the typical British shops such as Topshop and several shopping centers up to 5-6 floors high where you can buy everything from cosmetics, furniture, clothes and so on. Mayfair Oxford and Oxford Streets are the best areas for shopping in London, with over 300 stores. Oxford Street measures about 2 km and a half and it would take almost a whole day to travel so do not make other plans. On Bond Street you can find many boutiques and another famous street is Savile Row which once was recognized for men’s fashion houses and today is much modernized. If you are looking for Gucci or Sergio Rossi shoes, here is your destination and you can also find brands like John Lewis and Debenhams in the legendary Selfridges. South Kensington, Chelsea and Knightsbridge are three shopping areas renowned for their quality in which you’ll find famous brands. Carnaby Street is an area with 12 streets where you can buy the most famous creations made by fashion designers. You should not miss Kingly Court, a 3-storey shop where you will find truly unique items. Whether you are looking for clothing, unique gifts, sweets or jewellery, Covent Garden is the place to go. At the same time, you should not bypass the Floral streets, Monmouth, Shorts Gardens, Seven Dials and Neal’s Yard if you want to experience the most distinctive shopping aresa in London. Regent Street is an elegant shopping place, where you will find the oldest shops in London: Hamleys, The Apple Stone and Liberty. Westfield London is another innovative place to shop, dine or spend your free time. Here, you will find brands such as Next, Marks & Spencer, House of Fraser and also over 275 stores with more than 700 luxury brands such as Louise Vuitton or Jimmy Choo. Harrods is the perfect place where you can find anything you want, from food to clothing, electronics and even furniture. It is a place of shopping for all tastes and all budgets. You can find here your favourite stores including H&M, Topshop, New Look, Dorothy Perkins and Primark. The easiest way to get to Harrods which is on 87-135 Brompton Rd, Knightsbridge SW1X 7XL is with a transfer service. One of the most affordable transfer service companies is 247 Airport Transfer and the price from Central London will be around 20 pounds for a car which is up to 4 passengers. Besides the time you’ll spend in stores, you will notice the world around you and especially the avant-garde style of Londoners, which is never boring. You’ll return home with empty pockets but with a full luggage!